Are you looking for increased exercise performance or the ability to gain an edge when it comes to your athletic endeavors? If so, you can talk with Dr. Dubroff at Holistic Solutions about your ability to enjoy Sermorelin for athletic performance drugs in Oceanside. The pituitary gland in your body works to put out nine different hormones that are crucial for helping to maintain a variety of basic processes, such as water balance. One of these important hormones that come from your pituitary gland includes HGH or human growth hormone. This hormone is crucial for having a cellular metabolism that is healthy and it plays a big role in the promotion of all of the physiological functions that have to do with quality physical activity. Sermorelin is a natural peptide that helps to stimulate the natural production of HGH in the body. You can think of it as a way to kickstart this process so that your body has the power that you need to enjoy more intense workouts, shorter recovery periods after physical activity, and a drastic increase in the lean muscle mass of your body while cutting back on fat stores. Working with a professional naturopath will always give you customized treatments that allow you to treat your body as a whole. There is a focus on getting to the “root of the problem” instead of simply masking symptoms. Dr. Joseph Dubroff has been helping patients just like you by introducing Sermorelin as a way to naturally boost HGH production. As a result, patients have the ability to lose weight, improve sleep habits, enjoy more energy, and have incredible results with each workout or physical activity. 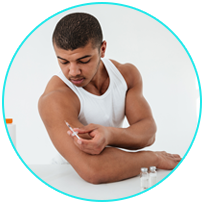 Holistic Solutions can help you with Sermorelin for athletic performance drugs in Oceanside. Call (619)272-2133 for more information or to set up a time for an initial consultation.